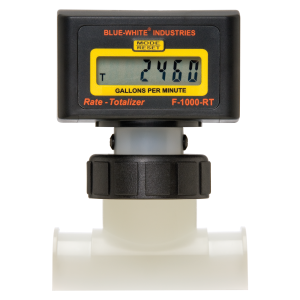 You can use paddle wheel flowmeters to accurately measure and dispense predetermined volumes of water or other compounds. These flowmeters, also known as insertion flowmeters or inline flowmeters, provide relatively high accuracy for their low cost and some insertion versions are easy to install. Pathfinder Instruments have paddle wheel flowmeters that work best with clean fluids—particles can prevent the paddle from spinning properly. They offer fast response time and are easy to maintain. Paddlewheel sensor: designed to be inserted into the pipe fitting. The sensor consists of the paddlewheel with imbedded magnets and the electronic sensor. About half of the paddle extends into the flow stream. Fluid flowing through the pipe instigates the spinning of the paddlewheel. Magnets in the paddle spin past the sensor. The electrical pulses produced are proportional to the rate of flow. Flow display/controller: picks up the signal from the sensor, converts it into an actual flow rate or flow total value, and displays the values. The processed signal can open and close valves, start and stop pumps, indicate high or low flow rate alarms in the system, and more. View our selection of Paddle Wheel Flowmeters. Contact Pathfinders Instruments today to get any of your questions answered.